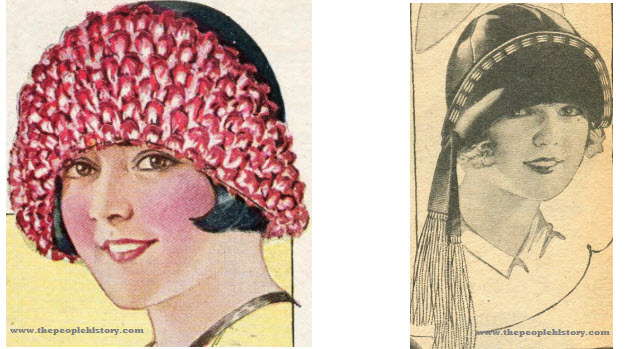 Below is a selection which includes two examples from each year of ladies hats from the 20's, each of our 1920 to 1929 years includes many more use the dropdown option on the right hand side of the page to browse each year, there are 2 pages for each year one for Clothes and the second for accessories, hats are included in the accessories page. 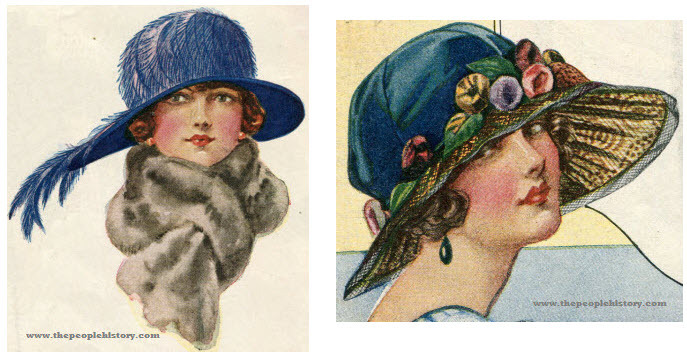 As you go down the page you can see the styles change during the decade. Description Close-fitting, this model is a chic combination of bright Ray-Faille with popular Pedaline straw trim and dainty floral sprays. The straw bands the hat and mounts the sectional effect crown in crescent design. Tight back; jaunty soft side bow. Description In this lovely hat, the crown shows the fashionable cording, and the stitched brim is slashed and turned up at side. The material is rich silk velvet combined with faille silk. Plush flowers and tinseled net form the trimming. Colors include rosewood, monkeyskin, Copen blue, sand, oakwood brown, or black. Description Note the smart hat illustrated at the left--a close-fitting model showing lustrous allover embroidery. 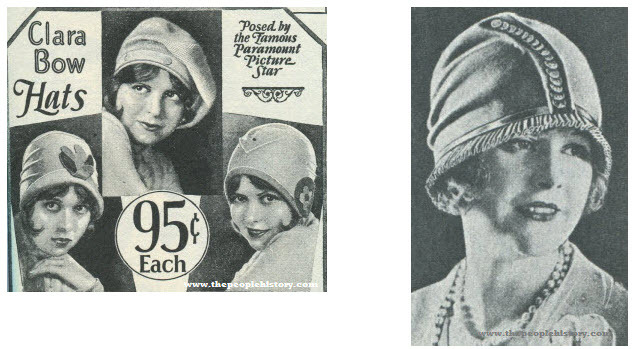 A soft crushable hat which comes low over the ears in latest mode, and is finished with a brilliant ornament at front. Colors come in a combination of sand brown and orange or Copen blue with rose and sand. 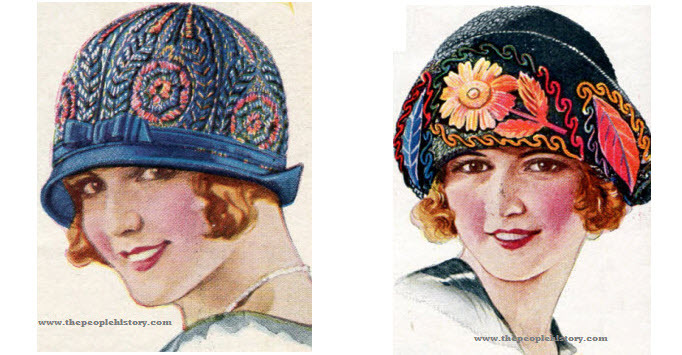 Description A charming faille Hat, gay with contrasting braid embroidery and gold edged brim. Smart to wear year round. 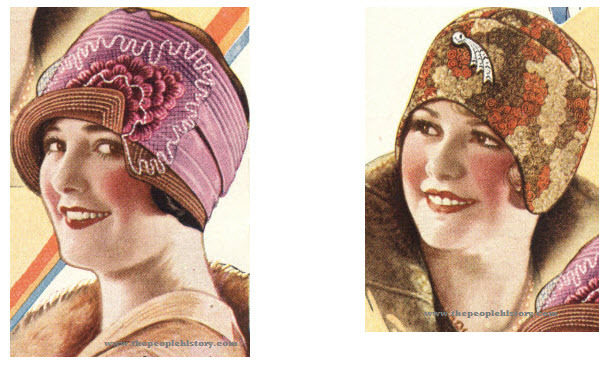 Description Dressy, practical hat of imitation hair braid draped over colorful fruit group. Strawcloth brim. A smartly flattering style for the fashionable matron. Description A new idea, and very striking, too. Snug fitting turban with fitted crown of good quality Rayon taffeta. 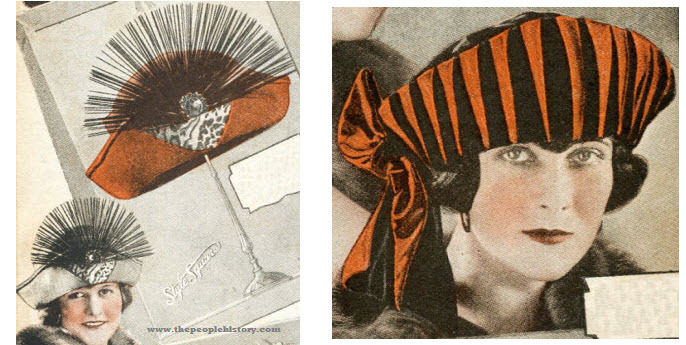 Entire brim is of narrow, picot edge ombre (shaded) ribbon, shirred cleverly to resemble a mass of sweet pea petals. High grade workmanship. Description Nifty little hood of good quality millinery satin. Fitted six-piece crown fits head snugly at back. Becoming oval brim shows border of metallic stitching. Grosgrain ribbon sash with fringe ends. Description One of this season's niftiest little shapes. Tiny poke brim with smart turn-up across back of lustrous visca straw cloth. Six-piece visca crown entirely covered with very rich looking Rayon and metallic thread embroidery. Description Attractive gay color Rayon (artificial silk) braiding and shaded plush and taffeta appliques lend a rich tone to the front of this new deep brim turban. Made of visca straw cloth. Brim is cut away at back, allowing crown to fit head snugly. Ribbon crown finish. Colors come in black, Copenhagen blue, or sand color (all with bright colored trimming). 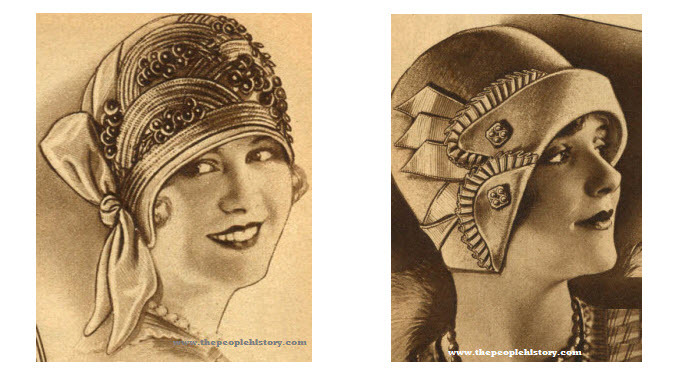 Description "Nacre" feather trims are the rage in New York. Choose from bright blue with shaded blue and orchid feathers, oakwood, pearl gray, or navy blue. Description Perfectly gorgeous and our best large brim fancy dress hat. Stylish six-pieced crown of fine silk faced velvet. High grade wreath of mixed colored fiber silk plush novelty morning glories. Description Fan shaped glossy jet black cellophane ornament, centered on metallic brocade insert, makes a stunning, rich looking trim. Brim in back shaped same as front, but a trifle narrower. Finished with beautiful lining to match. Description Something very different and expressly smart, slightly tricorn in shape. 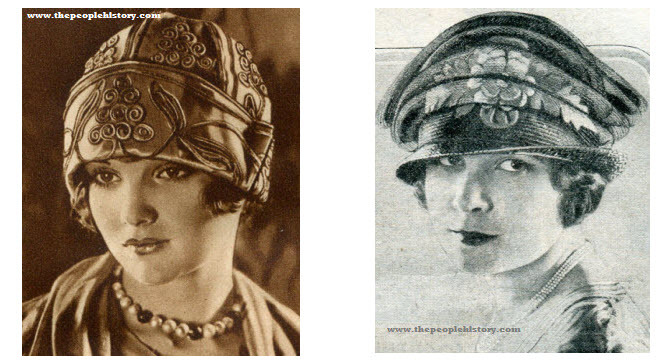 A snug fitting turban, yet, because of its wider sides, will become the larger featured type as well. Gorgeous satin lining in color to match. Description A Paris style welcomed by smart New York. Stylish black veil drape of dainty pattern, combined with cluster of large cherries make the trimming. Braid in crown has interwoven metallic colored thread for novel touch. Description Two good quality, nicely curled ostrich plumes caught with dainty rosette of braid. Colors are a black hat with peacock blue facing or solid black. Description Bobbed hair is a style that is fast becoming popular. However, you need not cut off your own hair to achieve this charming effect. Wear the National Bob and see how much it adds to your attractiveness, style and youth.